URBANPHOTO: Cities / People / Place » How Tall is Too Tall? The Burj Khalifa defies the imagination. It stands nearly one kilometre above the streets of Dubai, spanning a total of 163 floors — 209 if you could the maintenance levels in the building’s spire. When it was completed in 2010, at a cost of more than US$1.5 billion, it was by far the world’s tallest building and almost certainly its most extravagant. That extravagance was made all the more apparent by the economic turmoil that shook the world just before the Burj was set to open. 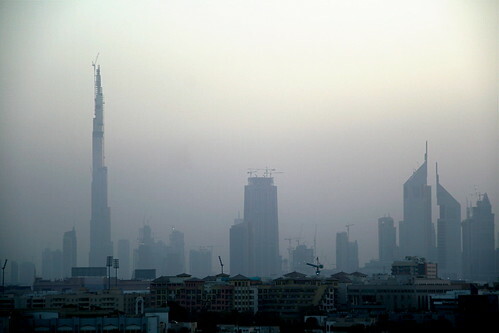 Dubai was on the verge of bankruptcy, saved only by a US$10 billion bailout from the ruler of nearby Abu Dhabi, for whom the Burj was ultimately named. With most floors standing vacant and maintenance costs as dizzyingly high as the building itself — it takes a full four months just to clean the windows — the Burj revived long-standing questions about the sustainability of super-tall skyscrapers. Those questions are especially relevant in Asia, where seven of the world’s ten tallest buildings can be found. Another 30 buildings taller than 300 metres — generally considered the limit between an ordinary high-rise and a “super-tall” — are now under construction in South Korea, China, Taiwan, Vietnam, Thailand and India. But extravagantly tall buildings do have their advantages. “There’s good vanity and useless vanity,” says Paul Katz, director of Kohn Pedersen Fox, which has designed many of the world’s tallest skyscrapers, including the Shanghai World Financial Center, the recently-completed International Commerce Centre in Hong Kong and the Ping An International Finance Center in Shenzhen, which will be the world’s second-tallest building when it is completed in 2014. 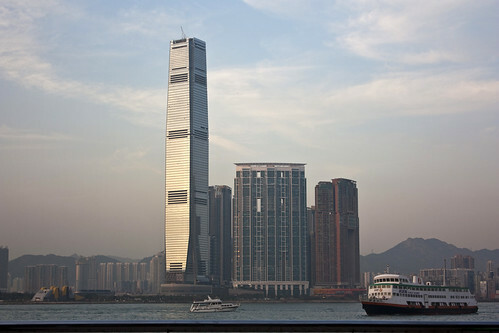 A key to doing that is to ensure that super-tall skyscrapers anchor a cluster of other high-rises, all of them linked to a well-developed public transportation network. Adaptability is another essential ingredient. “Buildings that are too idiosyncratic make it hard to adapt to other uses,” says Katz. “Many of the tall buildings in New York have seen their uses change many times over the past hundred years,” such as the Woolworths Building, once the world’s tallest, which was a corporate headquarters when it opened in 1910 and is now home to a mix of educational institutions, offices and apartments. Other architects are exploring even more innovative ways of making skyscrapers sustainable. 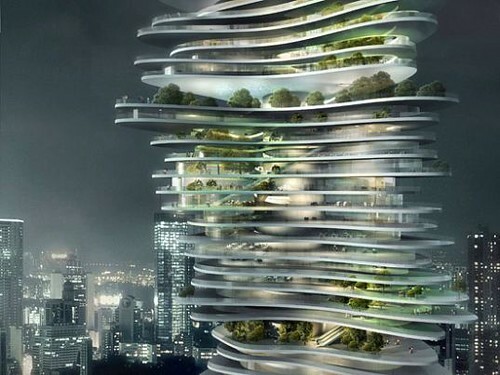 MAD Office founder Ma Yansong, who recently designed the 358-metre Sinosteel International Plaza in Tianjin, is now working on Urban Forest, a 385-metre mixed-use tower that incorporates gardens on every floor, as a way to humanize a form that has traditionally been driven by technology. For all the criticism levied at buildings like the Burj Khalifa, however, there is still a symbolic power attached to structures of great height. When the World Trade Center in New York was destroyed by terrorists on September 11th, 2001, a decision was eventually made to replace it with an even taller building. The new One World Trade Center will open next year at a height of 541 metres — or 1,776 feet, a representation of the year the United States declared its independence as a nation. This article first appeared in the October-November 2011 edition of Surface Asia. This entry was written by Christopher DeWolf , posted on Monday January 09 2012at 01:01 am , filed under Africa and Middle East, Architecture, Asia Pacific, United States and tagged China, Development, Dubai, Hong Kong, New York, Skyscrapers, Super-Talls . Bookmark the permalink . Post a comment below or leave a trackback: Trackback URL. For all its flaws, the Burj Khalifa is probably the most visually appealing of the massive skyscrapers built in the last 10 years, far more than Hong Kong’s IFC (which kinda screwed up the skyline) and the god-awful Taipei 101. However, as you say, Dubai is not working to “ensure that super-tall skyscrapers anchor a cluster of other high-rises.” The skyscrapers sprawl out along a long highway. I also find the Burj beguiling, but it seems like more of a monument than a functional building, because of its extreme height and the impracticality of its floor layout. I suppose it’s a good symbol of the decadence of boomtime Dubai. The ICC is dull but not entirely unremarkable, and I’ve begun to appreciate its presence. It looks quite good from certain streets in Kowloon, and the way it mirrors the IFC is attractive when seen from the west. Together, they’re a bit like modern-day Pillars of Hercules guarding the entrance to Victoria Harbour. Interesting thought about the Pillars of Hercules, too. I was thinking the same about 1 WTC and the Shard, on either side of the Atlantic — both are sort of similarly crude, ugly, huge glass pyramids.